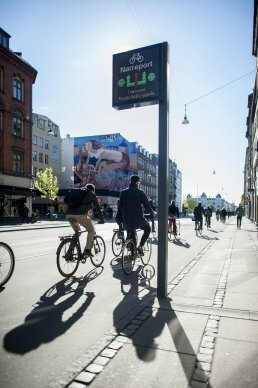 Copenhagen's new traffic management platform is promoting green transport across the city, and making the municipality more climate-friendly. Copenhagen is a world-famous cycling city. Every day thousands of Copenhageners use a bicycle; on average, they bike over 1.3 million kilometers each week. Copenhagen Municipality has implemented a new traffic management platform, a so-called Intelligent Transport System, to further promote cycling and the use of public transport. The traffic management platform can monitor the current traffic situation and intervene in events, both unforeseen and planned. In this way, the platform increases travel efficiency for cyclists and public transport users. By connecting the platform to municipal traffic signals, it can cut 10% of cyclists’ travel time and reduce bus passengers’ travel time by up to 20%. The traffic management platform will contribute to CO2 reduction and will be part of Copenhagen Municipality's goal to become CO2 neutral by 2025. Cyclists are prioritized with targeted real-time information on electronic information boards along the roads. By strengthening both biking and public transport methods, Copenhagen hopes to make green transport even more attractive and cut CO2 emissions from the transport sector. Swapping four wheels for two can have mental and physical health benefits, while contributing to a greater quality of life for others through reduced air and noise pollution. The project supports green infrastructure innovation by prioritizing the primary method of transportation in Copenhagen and making the bicycle the more attractive option. Bikes are second only to walking in terms of CO2 emissions and resource consumpti- on, so replacing car journeys with bicycles can help cut emissions from the transport sector.